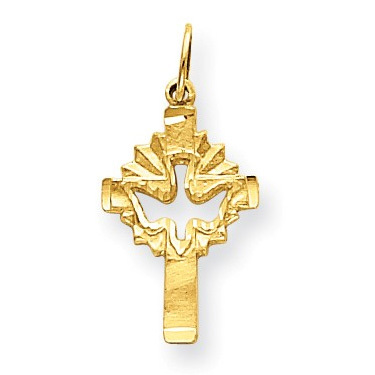 A solid 14k yellow gold cross pendant with the Biblical symbol of the Holy Spirit dove cut out of the center. The Christian dove cross measures 27mm x 14mm (1" tall with hoop/bale x just over 1/2" wide). Add a 14k yellow gold box chain to turn it into a cross necklace (optional). "And the Holy Ghost descended in a bodily shape like a dove upon him, and a voice came from heaven, which said, Thou art my beloved Son; in thee I am well pleased" (Luke 3:22). We guarantee our 14K Gold Cut-Out Holy Spirit Dove Cross Pendant to be high quality, authentic jewelry, as described above.